On behalf of the men and women of the Dallas Police Department, congratulations on your interest in becoming a member of the Dallas Police Department! The Dallas Police Department was founded in 1881, and it is the 2nd largest police department in the State of Texas and the 9th largest police department in the country. The Dallas Police Department is comprised of over 3300 sworn members and over 500 non-sworn members. The Dallas Police Department provides police services to over 1.3 million citizens who reside in a ci​ty occupying 3​85 square miles. 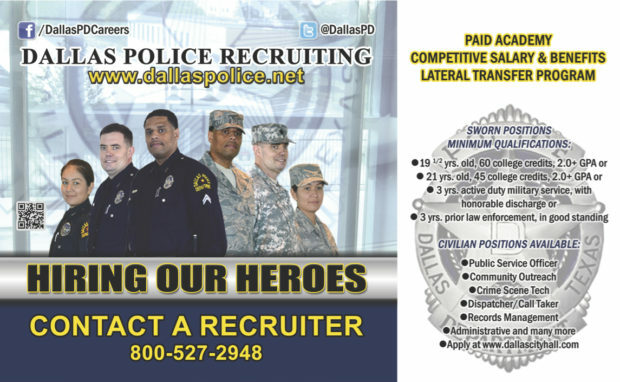 The Dallas Police Department is dedicated to recruiting, hiring, and training the most qualified applicants. The Dallas Police Department offers a wide range of assignments and more opportunities for advancement and professional development than other departments. Please become familiar with this new website, it contains useful information about our testing and hiring process. This is the first step in a rewarding career with a progressive and diverse police department. Recognizing that its goal is to help people and provide assistance at every opportunity; Providing preventive, investigative, and enforcement services; Increasing citizen satisfaction with public safety and obtaining community cooperation through the Department’s training, skills, and efforts; and Realizing that the Police Department alone cannot control crime, but must act in concert with the community and the rest of the Criminal Justice System. In achieving this mission, the men and women of the Dallas Police Department will conduct themselves in an ethical manner. They will: Respect and protect the rights of citizens as determined by the law; Treat citizens and their fellow employees courteously and with the same amount of dignity with which they expect to be treated themselves; Be examples of honesty and integrity in their professional and personal lives, thereby earning the public trust; Perform their duties with the knowledge that protection of the lives and property of all citizens is their primary duty; and Comply with the spirit and letter of the Code of Conduct.